The Community Garden at Holy Nativity is an all-organic teaching garden, located on the grounds of Holy Nativity Church in Westchester. Food grown in the garden is donated to the needy, typically via Food Pantry LAX or Westside Food Bank. 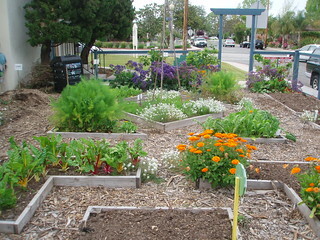 Organic vegetable gardening classes are offered each month for the general public. The garden site includes vegetable plantings, a mini-orchard of dwarf fruit trees, several types of rainwater harvesting, on-site composting, and live rabbits. The garden is maintained by a diverse team of volunteers who meet each Thursday to tend and harvest. The garden has been expanded several times over the years, and now wraps around and between the church buildings. It is located on a public street corner with no gates; it is open to the public at all times of all days. Peter returned from a retreat with his church’s leadership circle and announced that Holy Nativity was going to tear up the side lawn and plant a food garden. The garden groundbreaking was in January 2008, with an interfaith dedication ceremony that spring. By June 2008, we had begun harvesting, and the weekly harvests have continued — virtually unbroken — ever since. The entire garden is a high-intensity, high-production garden. Our garden is located in Southern California, which means we have a year-round growing season; we can (and do) harvest every single week of the year. Peter’s taste for art and design led to the beds in the main garden having a unique shape and layout. In the main, blue-fenced area of the garden, there are four groupings of growing beds, which we call “patterns.” The shapes of these are a simplified version of what you might find at a French chateau. The vegetables are grown in-ground (not in raised beds, since those aren’t appropriate for our dry SoCal climate). The wooden frames serve merely to direct foot traffic and keep pedestrians on the pathways. We use biointensive spacing inspired by John Jeavons. The intensive plant spacing serves several purposes: it squeezes the most productivity out of a relatively small section of land; it spaces plants as close together as possible without hampering their root development or bringing on pests and mildew; it spaces plants such that their mature foliage shades the soil and reduces evaporation, maintaining steady soil moisture levels for the benefit of the soil organisms. Rich, healthy, alive, organic garden soil is the heart of our garden. 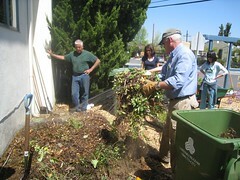 We maintain on-site composting of all kitchen and garden waste. This means we have trained the many groups which use the Holy Nativity site (coffee hour, yoga center, girl scouts, Welsh choir, cooking classes, Weight Watchers, Food Forward gleaners) how to use the compost operations. We follow a strict crop rotation, to help keep soil-borne pests and diseases in check, and to assist with soil fertility. After many years of wrestling with climate-inappropriate East Coast and British rotation schemes, we developed our own. Ours is customized for SoCalif’s year-round growing season. We developed a Vegetable Crop Rotation Wheel for use in our garden classes; this planning tool is now available to the general public. There are four different types of rainwater harvesting demonstrated on the property. Two very visible above-ground rainwater tanks usually capture vistors’ attention. These hold 1,240 gallons of water, collect from one single facet of the campus roofs, were expensive to install. They have not been trouble-free, and they require ongoing maintenance, something we’re still in the process of figuring out how best to cope with. Additionally, most gardeners are accustomed to city water pressure coming through a hose; with rainwater tanks the experience is vastly different. Thus the big discovery has been: rainwater harvesting causes us to re-think many aspects of our gardening practices. The swale-and-berm combination in the mini-orchard is visually subtle, yet a highly-functional, low-tech installation. The only cost involved was sweat-labor, a peek at a Permaculture design book, and a good shovel. It has been easy to maintain, with little needed (except when a film crew plowed through it). It does a great job of capturing and infiltrating rainwater and irrigation water, preventing these from being lost via the neighbors’ driveway. A small, home-style rain barrel, currently installed in the inner courtyard, is effective for collecting water for container plants. More at Joanne’s “In defense of rain barrels” blog post. 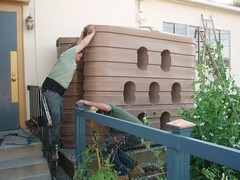 Of all our rainwater harvesting techniques, our favorite is the rainwater harvesting garden. Four dwarf citrus trees are watered by the rain that falls on the yoga center roof.